PGS is seldom performed in Europe, and even in the United States, the majority of IVF patients will not have their embryos PGS-tested. Given PGS’s alleged benefits, what are the arguments that cause patients and clinicians to pause, and which of those have the most merit? We categorize these criticisms into: (1) The risk of biopsy, (2) Accuracy Concerns, (3) Improper Patient Selection, (4) Faulty Marketing, and (5) High Cost. We’ll handle each in this chapter, except for cost, which will be addressed in the next chapter. Data from one clinic clearly demonstrates that biopsying an embryo at Day 3 (cleavage stage) hurts implantation rates, but biopsying an embryo at Day 5 (blastocyst stage) likely has only modest impact on implantation rates. With that, most in the industry declared the biopsy to be harmless. We should note two critical items here. First, the endpoints from this study are not great. In this study the team looked at “implantation rate”, which is far less relevant than live birth rate. And if live birth rates are equivalent, is there any impact to the offspring? In a separate study (from the same clinic) singleton births from PGS and non-PGS tested embryos had similar gestational periods and birth-weights, which is reassuring that the PGS biopsy may not be harmful. We have yet to see any studies looking at the long-term impact of PGS biopsy on offspring. Second, this data comes from a single center and the expertise of the team doing the biopsy may not be generalizable to most clinics. If an embryologist cleaves too few cells (3 or less), there is a good chance the biopsy cannot be read. If the embryologist cleaves too many cells, she endangers the pregnancy. Below is data from the same center comparing Live Birth Rates between groups of embryos where small biopsies were taken and large biopsies were taken: larger biopsies correlated with lower live birth rates. Thus, who is doing your biopsy probably determines the readability of the PGS and the impact on the embryo. Embryos are too complex to make judgements from the small number of cells we collect and, because of the complexity introduced by mosaicism (which we explained in the previous chapter), there’s a chance we misdiagnose an embryo by testing a sample of cells that doesn’t represent the whole embryo. Not only are we analyzing too small of a sample, but because we need to amplify the sample to study it, we’re not analyzing the sample itself, but rather copies of copies of copies of that sample, and that introduces error. Clinics and laboratories use differing technologies and algorithms to perform PGS and very few have rigorously tested how accurate their predictions of viability really are. Thus, patients and doctors are making critical choices with untested tools. Theoretically, if PGS were reliable, similar clinics treating similar patients would see similar rates of euploidy or aneuploidy. However, that's not happening, as evidenced by the results below of two thought-leading clinics located less than one hundred miles away from each other. By any measure these are massive differences, and this type of data makes many believe that PGS, and our interpretation of it, is not ready to be trusted. The frightening implication in the above chart is that if the clinic in blue’s data is accurate, than the clinic in red may be having it’s patients discard up to half of their euploid embryos. PGS bulls believe such clinic-to-clinic discrepancy is acceptable so long as each clinic tracks and tells patients how often embryos they’ve deemed euploid actually lead to a live birth, and similarly how often embryos they labeled aneuploid actually lead to a live birth. In other words, differing rates of euploid and aneuploid are acceptable if we know how predictive each clinic and lab’s interpretation really is. However, almost no clinics and laboratories have such data. Instead, most cite data from other clinics and laboratories. But given the difference in each clinic’s culture conditions, biopsy ability and the platforms/algorithms used by the interpreting reference labs, data from other clinics and labs is irrelevant. More ominously, it means that the clinics and labs themselves do not know if their euploid, mosaic or aneuploid diagnosis is any good. Many doctors do not want to do PGS on older patients (40 years and older) for two fundamental reasons (which we’ll list here and articulate below). First, they don’t believe we need an embryo selection tool for patients with few embryos of low quality, which is often the case with older patients. Second, they don’t want to take any steps required for PGS that might cause us to harm, or discard, otherwise good embryos. In general, for older patients these doctors have a high tolerance for failed transfers and miscarriage, and a low tolerance for any possibility of harming, or discarding, an embryo with potential. Older patients often have very few good embryos and thus very few options. Using a selection tool only takes options off the table, which these doctors aren’t comfortable with. Instead, they would rather transfer two, three or four embryos. While transferring multiple embryos is generally risky, there is little risk that transferring multiple non-PGS tested embryos for this patient population will lead to a high order multiple birth. For this reason, ASRM believes it’s safe to transfer up to 3 untested embryos per transfer at ages 41 and older. Finally, many doctors believe failed transfers and miscarriages are an inevitable byproduct to improving an older patient’s chances of success. They believe patients understand this, are willing to make the tradeoff, and thus miscarriage is more tolerable for this group. First, PGS cynics assert we have few embryos to work with and the less we interfere with their natural development, the better. In their eyes this means exposing embryos to less time in the laboratory, fewer interventions like biopsy or the freeze/thaw process and more. Second, as we covered in our mosaicism chapter, PGS is still not error-proof and both the nature of the test, and our interpretation of it, can lead us to mischaracterize embryos (e.g. as aneuploid when they are in fact euploid or mosaic) and discard embryos that may have worked. In other words, we should let nature determine if an embryo will work rather than make the determination ourselves. PGS bulls feel very strongly that PGS should be used for older women. It is a fact that older patients have a higher percentage of aneuploid embryos that are unlikely to lead to a live birth. Thus a tool to select the few, if any, embryos that will work has benefit. One manifestation of this is a dramatic drop in the rate of miscarriage for older patients using PGS, as shown by one clinic. While many PGS cynics have a high comfort level with failed transfers and miscarriages, PGS bulls have a far lower tolerance. Failed transfers or miscarriages take a toll on a patient’s emotional well-being, financial resources, and cause setbacks of months or longer. Bulls argue that critics are out of touch with the pain of failure or miscarriage, and the importance patients place on taking the shortest path to a live birth. Also, bulls argue that time is the most important resource for this patient population. With every failed transfer or miscarriage, months are lost, and a patient might be back to square one needing to do another retrieval cycle, now a few months older. With PGS, a woman would get a signal early on if she should try to do another retrieval (or several) before attempting a transfer, and it would be far more likely for that transfer to result in a baby. We’ll cover this in more detail in the cost of PGS section. Doctors who believe PGS is wrong for younger patients (35 and younger) generally believe these patients have such a high proportion of euploid embryos that a test to select good embryos is not necessary. Women who are under 35 probably have around 50% euploid embryos, which means that their doctor will theoretically have at least a one-in-two chance of picking a euploid embryo the first time, even without PGS, and critics think this chance is high enough to make PGS unnecessary. This group already enjoys a relatively low miscarriage rate (below 15% at RMA New Jersey), and when younger patients used PGS, that miscarriage rate did not go any lower. PGS critics often cite a study from Cornell from 2016, claiming it shows PGS doesn’t improve live birth rates per transfer in younger patients. However, the study enrolled so few patients it was not properly designed to show statistical significance, and in our minds isn’t relevant to analyzing PGS’s value in younger patients. Bulls would respond that even young patients have a lot of aneuploid embryos (an average of ~50% isn’t trivial!) and that avoiding failed transfers and miscarriages is still an important goal, regardless of age. Also, that 50% number is just an average and you might not be average -- you might end up having more aneuploid embryos than other women your age and benefit from PGS surfacing that issue early on. PGS bulls also point to the increased confidence doctors and patients have to do elective single embryo transfer (eSET) following PGS. Younger patients are at higher risk of having multiple births after a multiple embryo transfer. If PGS drives more eSET in these patients, complications can be avoided. Finally, doing PGS can give patients insight into whether one retrieval will deliver enough quality embryos to have multiple successful pregnancies and complete their family. Rather than freezing embryos of unknown quality and waiting a few years to find out if they will work, proponents of PGS argue that having this information up front gives patients greater insight and control in planning the need for more retrievals. Patients are often told at the beginning of their cycle that their clinic uses PGS, “which increases a patient’s chance of a live birth to up 70%, far higher than the 30% odds for most patients.” That is false and misleading. PGS is just a tool to help us select the best embryo - it doesn’t do anything to improve the quality of your embryos. PGS does not change the quality of eggs or embryos a patient has and when clinics assert using the test somehow improves a patient’s odds of success, critics assert the test does not do what proponents claim. To be more specific, a patient must have embryos good enough to pass PGS-testing for the test to be encouraging. As you can see in the example below, it’s uncommon for an egg to become a euploid embryo and many patients who are prepared to pay for PGS testing will not have a single viable embryo. 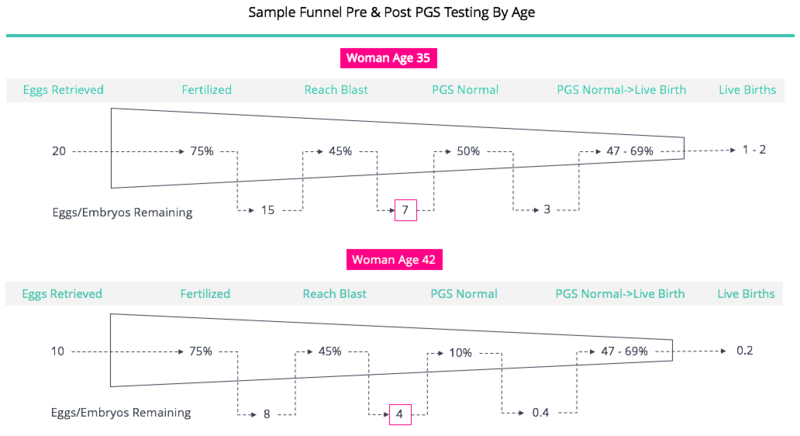 What’s more, if an embryo does pass PGS-testing, the likelihood it will lead to a live birth is likely below 70%, and probably closer to 48 - 69%. We view these criticisms as warranted, but more of an indictment on how doctors market PGS, which is separate from the value of the test itself. PGS often costs patients roughly $5,000. We find most criticisms of PGS are phrased in the context of “and for that, it’s simply not worth the cost.” In the next chapter, we’ll take a close look at the costs and economics of PGS.